The Savannah College of Art & Design (SCAD) recently launched a Branded Entertainment curriculum. Ever heard of branded entertainment? How about content marketing? Or storytelling, or brand journalism? They’re all marketing industry buzzwords to describe the latest step in the evolution of communications around marketing, public relations, advertising and technology. In recent years, as traditional media faded and smartphones put more power in consumers’ hands, brands have been evolving to meet growing consumer needs. Some, like Coca-Cola, have led the field with huge undertakings. And just down the street from Coca-Cola’s headquarters in Atlanta, the Savannah College of Art & Design (SCAD) is moving things along even further, particularly for the next generation. This spring, SCAD began classes in the world’s first “Branded Entertainment” college major, with the first round of graduates expected hitting the job market in four 2019. The phrase might be new to most people. But examples of branded entertainment are everywhere. Green brought about 30 students recently to a lecture and Q&A with Coke marketing executive Tom Daly. Among other things, Daly pointed out the company’s special strength in tapping the ever-growing mobile market. The SCAD students said they are drawn to the Branded Entertainment studies because of the changing nature of marketing – and their generation’s unique vantage point. Millennials haven’t grown up with earlier distinctions between marketing, entertainment and journalism. They do everything on their smartphones. They don’t want to be sold to all the time. Instead, they want to be involved with a brand. And content, whether a video game or a viral video, should do more than sell a product or service. With so many channels and media competing for our attention, brands have to stand out with relevant, engaging content. These students want to learn how to do that. 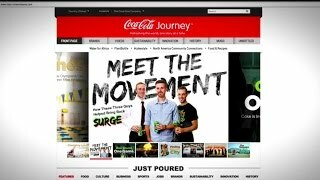 Khambrea Johnkins, 23, liked the successful Coke Zero soundwave campaign Daly discussed. Cans of Coke Zero had scannable soundwaves, which allowed consumers to listen to new music. Social media channels are among the most effective for brand marketing – Facebook, Twitter and others. SCAD students at Coca-Cola headquarters in Atlanta. SCAD program coordinator Judy Salzinger came to the school after a career in marketing and advertising. The Branded Entertainment prism helps make today’s fast-moving concepts understandable and engaging for students and parents. And it shows how the college – with about 10,000 total students and satellites in Europe and Asia – is innovating for the future. The program will help prepare students for careers in gaming, interactive media, TV and film, and more, she says. Branded entertainment is a multibillion-dollar market, with no signs of slowing down anytime soon.